I am a sucker for straight teas, so I couldn’t resist when DavidsTea released this as one of their new straight teas. Mao Jian Jade is a pan-fried green tea, and Mao Jian is a well-known Chinese tea. The overall fragrance of this tea reminds me of seaweed, there’s almost this light saltiness to the scent of this tea, mixed in some salad greens. I love the look of it, the leaves themselves almost look like they’ve been twisted and left to dry. Mao Jian Jade is a pan-fried green tea from the Fujian province. DavidsTea recommends steeping Mao Jian Jade in hot water for 2-3 minutes. Their website describes “hot water” as being 75-80°C (167-176°F). 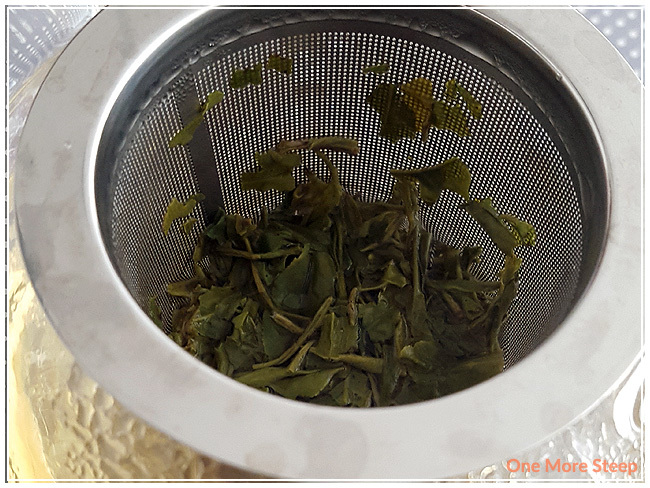 I used my Breville IQ Kettle‘s green tea setting which is 175°F, and steeped this tea for just under 2 minutes. Mao Jian Jade steeps to a very pale yellow. There’s a light salty, vegetal scent to the tea when I inhale it. 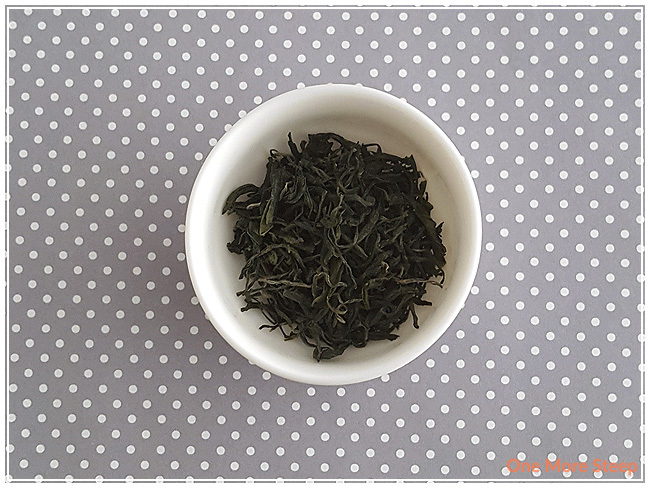 On first taste, I’m surprised by the light sweetness in the tea which pairs very well with the salty vegetal flavours that remind me a lot still of salad greens. There’s just this freshness to the tea that’s delicious. It’s a very delicate tea, for sure and I find that there’s zero bitterness. Green teas are often fickle when it comes to being steeped. 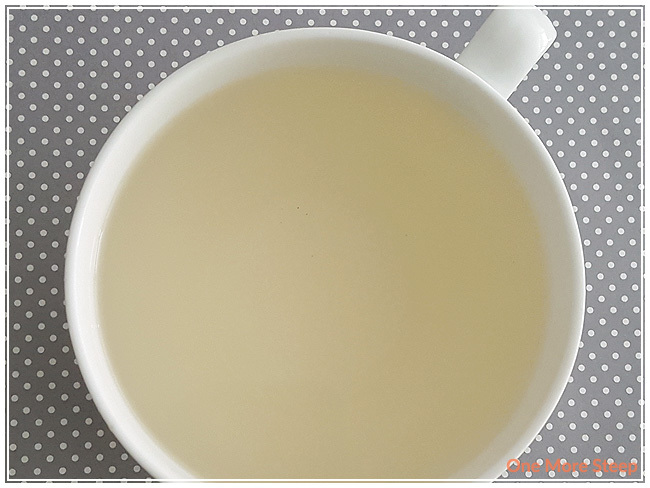 If the water is too hot or if the tea is steeped for too long, it can become unpalatable. If you’re having trouble with this one, I would recommend using cooler water with shorter steeping times. The result of a well steeped green tea is second to none. Mao Jian Jade does very well for subsequent steeps. I got seven resteeps in before it became too watery. The second steep was the strongest, I found, with it being much deeper in colour. This tea does well without added sweetener, and I would not add a creamer or milk to it at all. 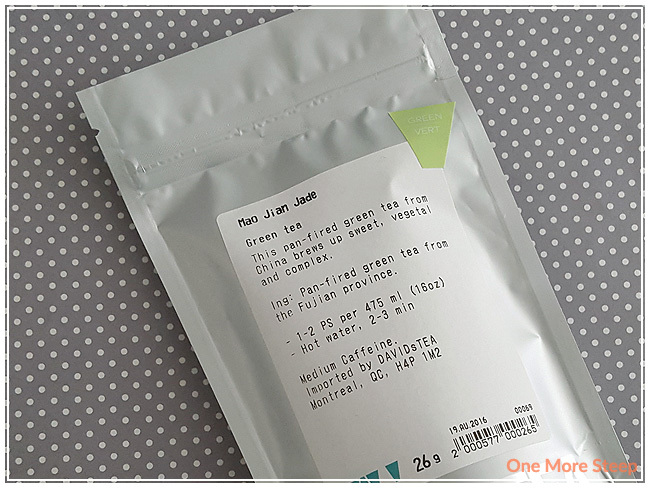 I loved DavidsTea’s Mao Jian Jade. I’m a huge fan of any tea that resteeps well and holds its own, which Mao Jian Jade definitely rises to the occasion. 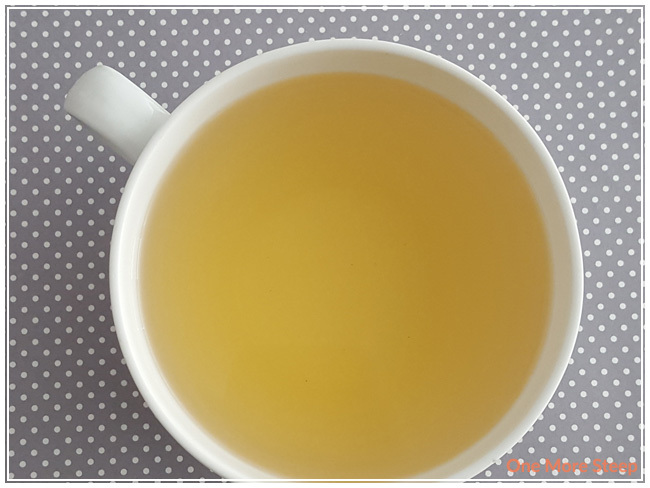 I found that the tea was very tasty, it’s light and has a beautiful flavour to it. The complexity of the sweet with the salty really adds to the experience of drinking this. As a straight tea, especially one that tastes good, it’s moderately priced and isn’t going to break the bank. I would strongly recommend resteeping this one throughout the day to get the most out of it.